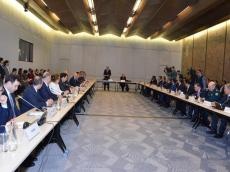 Garayev made the remarks at a meeting of the Organizing Committee created upon the Azerbaijani president’s corresponding order in connection with the 43rd session of the UNESCO World Heritage Committee in Baku, Trend reports. The minister highlighted the achievements of Azerbaijani President Ilham Aliyev and First Lady Mehriban Aliyeva in the development and strengthening of mutual relations between Azerbaijan and UNESCO. Garayev stressed that holding of the 43rd session of the UNESCO World Heritage Committee in Baku is indeed responsible work. "I would like to stress that initially the Committee sent the conditions reviewed by all state bodies,” he added. “The necessary work on their implementation was carried out." "By hosting this event and at the same time presiding there, Azerbaijan will make indelible mark on the history of the culture of the peoples of the world," the minister said. The 43rd session of the structure is connected not only with culture. Natural reserves are planned to be included in the list. Up to 3,000 representatives from more than 180 countries are expected to attend this session, which is considered one of UNESCO’s most important events. Among the topics put on the agenda is the inclusion of new sites in the UNESCO World Heritage List and the work being carried out in this direction. Then a website developed for the 43rd session was demonstrated, which will be fully ready for use until the end of March. The event will be broadcast via this website. Several meetings will be organized at the Baku Congress Center where the session will be held.